My family and I are celebrating Collision Course, the final installment of our favorite prehistoric family movie franchise with a delicious Ice Age movie treat recipe, and we can’t wait to share it with you. 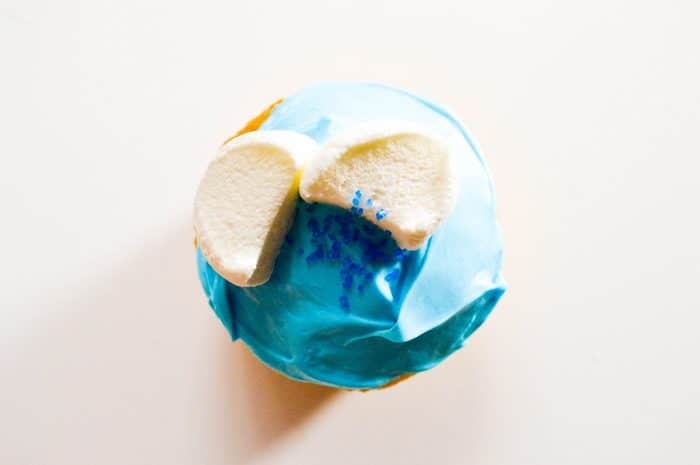 We whipped up a batch of cupcakes that pay tribute to the glacial period in which the film takes place. As I’m sure you know, throughout the films, Manny, Diego, Sid and the gang journey to find a safe place to call their home as the earth constantly changes around them. These fun movie treats are a great way to teach your kids a little bit about that time period. As you’re decorating the cupcakes, talk to your kids about what life was really like for the animals and the earth back then. If you need some help coming up with ideas (or a quick refresher course of your own), DiscoveryEducation has some great free lesson plans. Of course, you don’t have to make this Ice Age movie treat recipe with an educational experience in mind. You can just whip it up as a fun way to bond with your kids over one of their favorite movies! Let’s check it out, shall we? Do you have a favorite movie-inspired treat recipe? Share in the comments! Affiliate links included below. For the base mix, we used the same basic recipe as our Cherry Vanilla cupcakes. It’s such a versatile recipe! Set up your cupcake pan with liners. 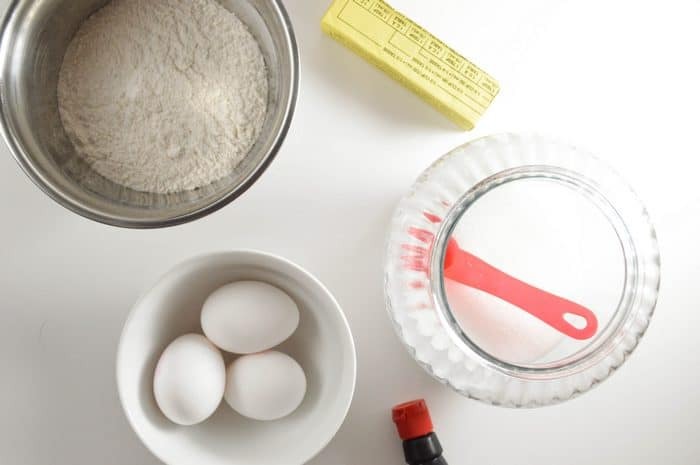 Whisk the flour, baking powder, salt, and baking soda together in a medium bowl. In a separate large mixing bowl, beat butter with an electric mixer or Kitchenaid on medium to high for 30 seconds. Add sugar, vanilla, and almond extract to the butter and beat until combined. Add egg whites and eggs one at a time, beating well after each. Using an electric mixer, combine all ingredients at medium speed and work your way up to high. If icing too stiff, add milk one tablespoon at a time. If too watery, add icing sugar 1 tablespoon at a time. 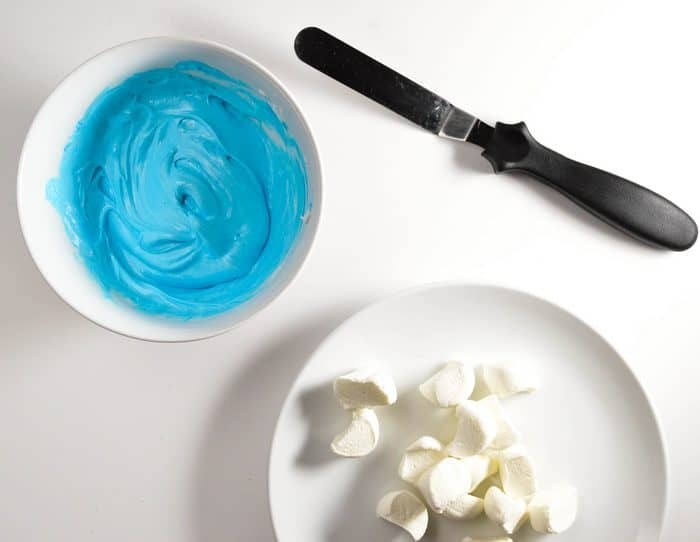 Add blue food coloring a couple of drops at a time to your buttercream icing until you reach your desired color. Top with marshmallow pieces cut into quarters, so they look like glaciers coming out of the water. You can also use mini marshmallows to create the effect. Sprinkle with crystal blue sprinkles. I know it seems like a lot of ingredients and steps, but honestly, it’s pretty easy to make. When you’re done, you have a clever Ice Age movie treat that’s perfect for family movie night or for parties! For more cute movie recipes, check out our Secret Life of Pets no-bake granola bars or our Finding Dory blueberry ice-cream! I’ll be making the Glacial Cupcakes for my grandkids. These cupcakes are so adorable! And my daughter is super excited about the last installment of Ice Age! yeah! These look tasty, but I love the whole movie theme idea. These are so super cute (and we LOVE the Ice Age movies). This would be a wonderful and fun treat for a family movie night. Thanks for sharing with us at Merry Monday this week! What a fun treat! This would be fun to make with my kids. 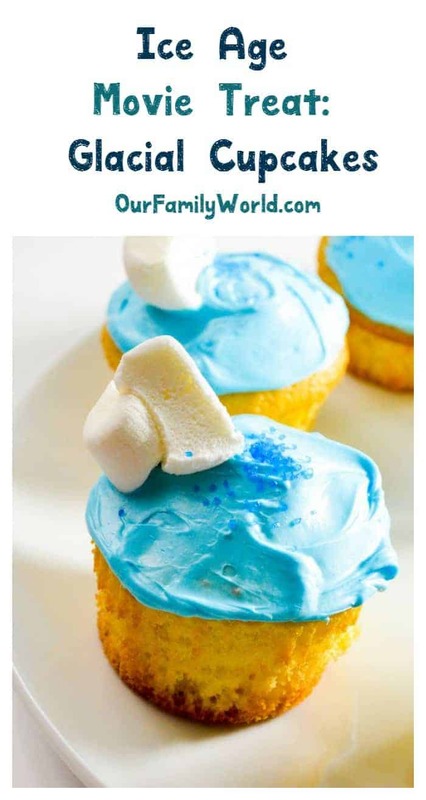 I love the idea of these glacier cupcakes! The perfect treat to celebrate Ice Age! I can’t wait for this movie to come out. This is a treat that is perfect to get them excited. Just in time for the movie! So colorful! Now these look so cute. They have an eye-opening color appeal. I plan on saving this recipe for my little niece. My kids would love this treat! They are obsessed with he Ice Age movies and this is the perfect snack to celebrate them. That’s such a lovely treat and you can get the kids to bake with you as well! I can’t wait for this movie and I’m sure it’s going to be awesome. Thanks for the lovely idea! I love theming treats to make our family fun nights something extra magical. The kids and I will have a great time making these before we head out to see Ice Age. I love to find my food to go with movies, my nephew loves to find out what I can come up with when he comes to visit and we have movie night. I don’t really have a favorite movie inspired treat at this time, but I bet if I Made these I would 🙂 They look super yummy and Ice Age is a cute film! Those tiny icebergs are really cute! These cupcakes would be perfect for fans of Ice Age! Kids will surely flip over these cuties! Looks yummy! My kids love the Ice Age movies and are excited to see the new release. These cupcakes would make a great pre-theater treat! My kids always loved Ice Age. What a fun movie themed treat! It’s like you were reading my mind. Anytime you do anything in cupcake form, I’m hooked. I can’t wait to make these! These are too cute, we love making cupcakes! Thanks for sharing your recipe we love trying out new recipes with the grandkids they enjoy spending time in the kitchen !